2016 Bodega Lanzaga (Telmo Rodriguez) “LZ” Rioja DO, Spain. One of Spain’s best winemakers, Telmo Rodriguez, who In 1998, returned to Rioja, after making wine in the Rhone at Jean-Louis Chave, and Bordeaux, more experienced and loaded with enthusiasm, wanting to explore a new era of Rioja wine. Besides crafting his family’s famous Remelluri estate, he is producing a signature line of wines made in his ancient cellar from purchased grapes within the region, which includes his Bodegas Lanzaga lineup, made from all organic vines. 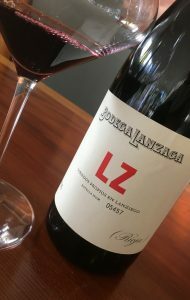 Telmo’s entry level bodegas Lanzaga bottling, which is the unoaked LZ , made as a Joven, is produced with a blend of old vine sites of head-pruned Tempranillo, Garnacha and Graciano in the Alavesa zone, and from the village of Lanciego. It is a star value offering with a Cotes-du-Rhone like feel, and though it’s a pure Rioja, but one with Telmo’s unique personality and charm showing through. The LZ, according to Telmo, who is very much a student and admirer of the regions history, is a tribute to the village grape growers of the 1920’s, who fashioned fresh wines like this. it’s a wine fermented in small concrete tanks with selected grapes from, as mentioned, local organic vineyards in the village of Lanziego. With LZ, Rodriguez and his team want to keep alive that memory through this wine. The vines for this little red are located at an altitude of 500 to 700 meters, and set on two types of soils, both of continental origin from the tertiary era, with sandstone and marls (limestone/clay) which gives this wine its vitality, Telmo, to express the true terroir here used native yeasts and raised this LZ with just 6-7 months of aging in concrete tanks. This 2016 is very dark in the glass with black and blue fruit notes and a mix of floral tones, mineral and spice on the nose that leads to a medium full vigorous palate that again reminds of the Rhone, similar to Vacqueyras, gaining pepper and anise with air, as well as layers of kirsch, racy currant and lavender. The texture is stylish, far more becoming than the price would suggest and the length is even more impressive, this is absolutely delicious stuff, both as a bistro sipper and or with rustic cuisine. Telmo is one one of the world’s most iconic winemakers, known for taking his own path, and while he makes some Grand Cru class stuff, you should not mis his basic LZ, it’s a tasty treat and an insane bargain, I can see a few more cases of this in my own future.